my fifth kidlife at dawson is in the books and appropriately, i have five favorite things i want to share from this year’s one way journey with Jesus. i am always in awe of how God does abundantly more than i could hope or imagine and allows a broken vessel like me to catch glimpses of His glory. 1 – Gospel team – while leading a child to Christ is what kidlife (vbs) is all about, i was finding myself rushed and running out of time to thoroughly counsel kids that marked they wanted to know more about Jesus. this reason and the ministry smarts of a former coworker and friend gave birth to the KidLife Gospel team. this team, made up of ministers and church staff, had two main jobs: 1 – greet and reach out to unchurched families and 2 – counsel kids that marked they wanted to talk further about a relationship with Jesus. here is what that looked like. unchurched outreach – on the sunday prior to kidlife, the Gospel team coordinator would pull the names of all the children that marked “no church affiliation” on their registration form. these names, kidlife class assignments, and parent contact information was divided among staff that agreed to be on the Gospel team. on monday of kidlife, Gospel team members found and met kids sharing with them how excited our church was that they were attending kidlife and prayed for their week. the Gospel team members also gave the kids a sticker (example here) to wear home that said they had met with a staff member. then staff members went back into their office and emailed the parent explaining that they met their child at kidlife and they were available for any questions during the week or after. this gives another contact other than children’s ministry to help minister to and meet the needs of these special families we were honored to have on our campus. lastly, the Gospel team member would fill out info on a google doc (example here) so that after kidlife all important information was stored digitally in once place. Gospel counseling – on wednesday our 3rd-5th graders heard a specific Gospel presentation in snack time and were given a chance to respond to a response card. (example here.) 1st-2nd graders heard the Gospel during the week and could ask to meet with a staff member, but didn’t get a response card. as soon as these cards were completed a youth assistant would rush these cards to the Gospel team leader. these cards were divided and assigned to different Gospel team members giving each staff member a smaller group of kids to talk to and more time to do so. 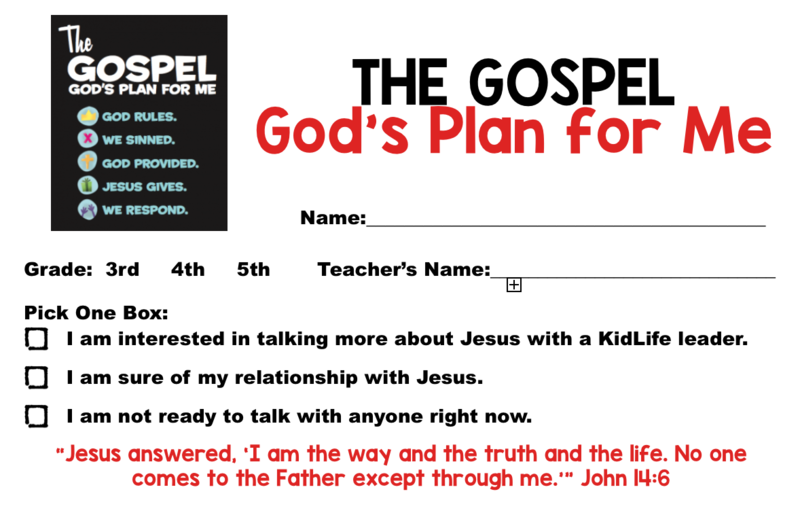 after speaking with each child, the Gospel team member would complete a report on a provided google doc designed especially for Gospel follow-up. (example here) then, the parents of each child that was spoken to were sent a letter from me, along with a copy of their child’s response card and a Gospel God’s plan for me booklet. high five guys – i simply can’t say enough about these men. i get to work with many amazing volunteer teams in ministry, but these guys are simply my favorite. this is our fourth year for high five guys and i have blogged about them before (see here), but we increased our number to ten guys and with more men comes more possibility for effectiveness. i often joke with them that i could disappear during the week and no one would care, but if they were not in their spots for high-fives and ready to listen to memorized scripture and anchor points, well the kids would revolt for sure. there is just something so powerful about seasoned, godly men investing, celebrating, encouraging, and challenging kids as they seek to know Jesus and His Word. this year they also got to shoot off confetti cannons in the worship rally and drive remote control helium sharks and fish above kid’s heads. we have some more things in store for them next year and can’t wait to take their ministry to the next level. bling, bling and more bling – it was our fourth season of bling (i have blogged about bling before here.) and with this tradition brought another year not only of kids memorizing anchor points, a memory verse, and a challenge passage, but also kids taking these tokens home to hopefully remind them of truths in the future. 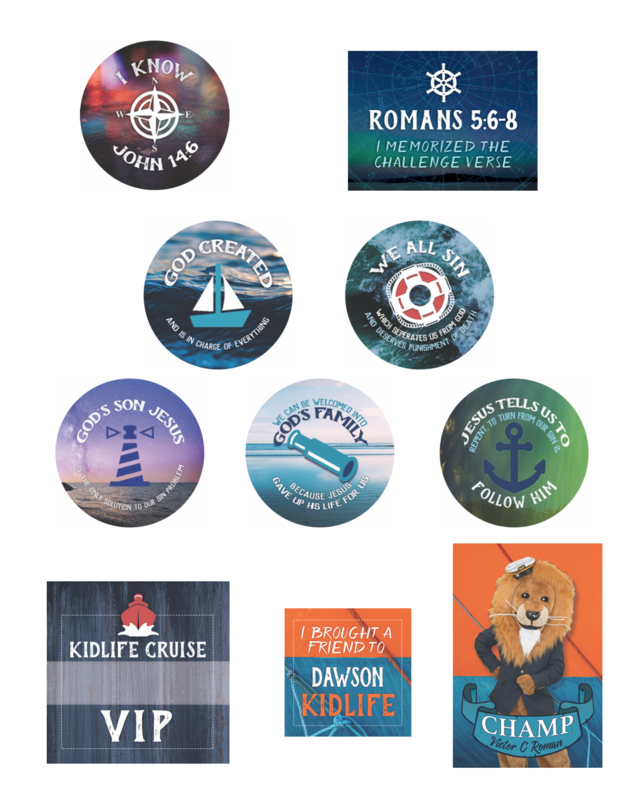 (click here to see this year’s bling designs) year after year i am convicted by the persistence kids show in not only memorizing the memory verse but the challenge passage. not only are kids hiding more of God’s Word in their hearts, they are challenging the older generation to continue to do the same. 3 – kids connection – one of my favorite ministries of dawson is the kids connection ministry. (learn more here.) thankfully a couple of years ago the Lord put it on a member’s heart to bridge the gap between the kids connection store and kidlife. now for the third year we brought kids in for kid life and watching them experience the truths of Jesus was nothing short of a God-sighting every day. once they are registered for kidlife through a kids connection counselor, their parents simply bring them to kids connection each morning. awaiting the kids is a team of compassionate, Jesus-loving volunteers to love on them. each child receives a kidlife drawstring backpack with their very own new Bible, a kidlife t-shirt, and a boxed breakfast. after kidlife each day the kids have a boxed lunch on the way back to kids connection to await their parent’s picking them up. this ministry is totally lead by selfless volunteers who passionately want to extend the reach of kidlife far beyond our neighborhood. they are the true kidlife heroes. 4 – kidlife cruise news – i take zero credit for our second year of kidlife nightly videos. our amazing communications staff took it upon themselves last year to create news-style videos to recap the day’s events and truths through videos and interviews. 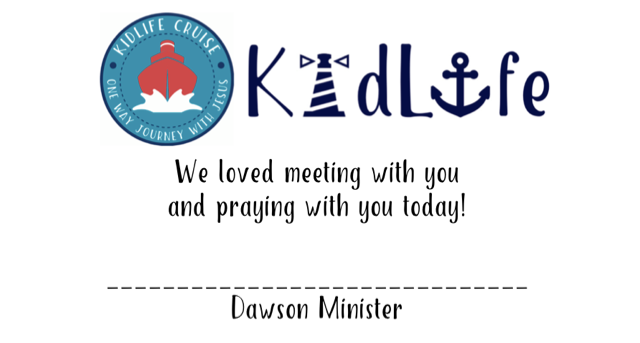 this year they called it “kidlife cruise news” and they were posted on our church’s facebook page every night at 7 p.m. this was a great way to give parents a peek at all that was packed into the three hours of kidlife, but also to connect them with our church’s social media. to check out an example of one of the recap videos, click here. 5 – staff videos – i am so grateful to serve with a staff that completely goes all in for kidlife each year. we had so much fun last year (click here for a glimpse of last year.) with staff videos promoting the theme, leader recruitment, and kidlife signups, we thought we would do it again this year. since we were cruising for kidlife we thought it would be fun to use our staff in a gilligan’s island and love boat video. not only did we make videos, we made posters to promote the theme throughout the church building and social media. you can check out the videos here: gilligan’s island & the love boat. not only do i love seeing kids come to Christ through kidlife, i love the realtionships built not only between adults and kids, but other adults as they serve in the trenches togther. i count it a privilege and a joy to be just a small part of all that God does through this week each summer. what is your favorite part of your vbs week? i am always trying to learn and grow, so i would love to hear your favs from your vbs this summer. comment below and let’s share ideas.